Human language can be considered an evolutionary system. Speakers trans­mit linguistic utterances in communication with others and these utterances can be subject to both mutation and selection. As such, a person’s linguistic knowledge, based on the set of linguistic utterances he or she has encounte­red, might gradually change over time. This is the evolutionary linguistic approach presented by Croft (2000). This thesis describes the use of this approach in the study of language change in a series of case studies. The purpose of this exercise is not only to get a better insight in the mechanisms that have played a role in the respective cases of change, but also to show that the evolutionary approach is a useful way to obtain these insights. For example, the quantitative nature of the approach makes it possible to use computer models to simulate and study specific cases of change. This thesis presents examples of such models. 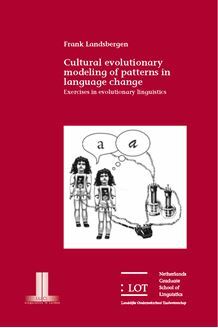 The presented case studies focus on patterns in change, such as the tendency for words to change from lexical to functional meaning instead of vice versa and the one form-one meaning tendency. Another investigated pattern is the development of the Dutch verb krijgen, which shows a commonly found change from agentive to non-agentive meaning. The results of the computer simulations suggest that these patterns can be explained by rather basic mechanisms such as differences in the frequency of use of the different variants in the case of unidirectionality, or by the competition between forms for a particular meaning in the case of isomorphism. Finally, a case study is presen­ted in which the historic development of the verb krijgen is reconstructed on the basis of synchronic variation in the use of the verb, using phylogenetic reconstruction methods.